Pursue a degree or take courses in political science or international relations. Discover notable individuals with Rochester degrees in political science or international relations. Our PhD program is one of the most rigorous and successful programs in the nation. Rochester alumni can be found in a range of fields, from law to business to education to government to sports. 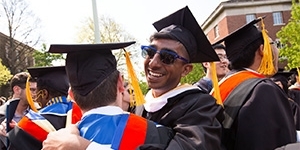 Explore the alumni network to make a connection! We partner with the Gwen M. Greene Career and Internships Center to connect students with jobs, internships, research opportunities, and more. Want more information about the Department of Political Science? Contact us.